I'm a Chinese/Taiwanese-American, born in Taiwan, raised on Long Island, went to college in Philadelphia, tried Wall Street and then moved to the California Bay Area to work in high tech in 1990. I'm a recent dad and husband. Other adjectives that describe me include: son, brother, geek, DIYer, manager, teacher, tinkerer, amateur horologist, gay, and occasional couch potato. I write for about 5 different blogs including 8Asians. When not doing anything else, I like to challenge people's preconceived notions of who I should be. I’m writing this on the day of my 30th High School Reunion. No, I’m not traveling the 3000 miles it would take to go there and be at the party tonight. So let me start by saying this isn’t going to be some happy ending story where the main character (loser, gay, nerd) goes to his high school reunion and finds out he’s the successful, happy, and well-liked person he never was in high school. Hollywood happy endings like that don’t happen in real life. Well, there is a happy ending, but you’ll have to get to the end of the story to hear what it is. First let’s go back 30 years and see who I was in high school and what being at my high school in the early 80s was like. My high school was similar to the ones in Breakfast Club, Sixteen Candles, and Pretty in Pink, (all 80s high school films) but only even more so if you can imagine it. Stereotypes on steroids. I say that because I attended at the time, the largest suburban high school in the United States (at least according to U.S. News and World Report). When you have almost 1500 students in your graduating class all under one roof, there’s going to be hyper-segregation. The jocks really only hung out with the jocks, the populars with the populars, etc. In my on-going quest to get my daughter fluent in Chinese, I came across the opportunity to review a book called “Learning Chinese Characters” published by Tuttle Publishing. In case you’re not familiar, I have a nine year old daughter, who started Chinese school when she was six. The uphill battle with Chinese school has already been well documented in this past 8Asians blog post. So I’m always on the look out for anything that can help make learning Chinese easier or more enjoyable. When I was a kid, and taking Chinese school classes myself, I remember my dad explaining to his class of adult learners about the history of the characters themselves in his attempt to make the characters more meaningful to his students. He’d show how the character for “eye”, 目, was really a pictograph of an eye, if you turned it sideways. That’s part of the premise of this book, “Learning Chinese Characters”. The idea is they’ve picked some of the most common words and show how either the character is derived from a picture, or overlaid a picture on top of the character to make its meaning more memorable. In addition they, add a phrase or saying with each character to help remember its meaning and general pronunciation. For example, they use a depiction overlay on the character that includes the picture of a “jeep” and a saying incorporating the word “jeep” to remind you that the word “several” in Chinese is pronounced like the “jee” in “jeep”. 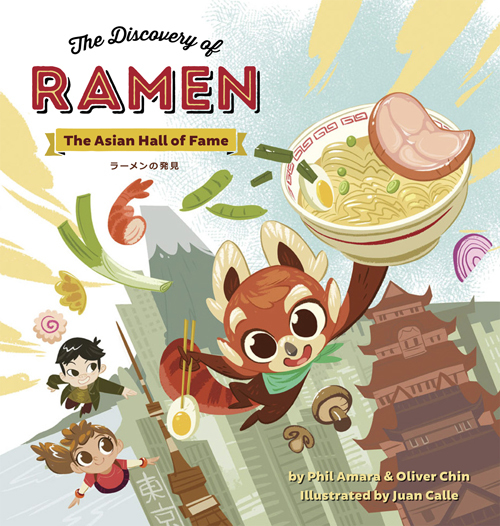 If you’re an Asian American parent like me, you probably struggle to find books for your kids that have the right blend of age appropriateness and entertainment while still offering a glimpse into the history and culture of your ancestry. Just in time for Chinese New Year, a new children’s e-book is available on Amazon. While the topic isn’t Chinese New Year, it does tackle the topic of why the Great Wall exists in China. The book is titled “The Emperor Who Built the Great Wall” and is written by Jillian Lin. During the introductory period on February 19 and 20, 2015 you can get the book for free. After the 20th it will be priced at $2.99. As a kid’s book, I really liked the historical story telling, but some of it may not be appropriate for the really young ones (especially the part about attempted murder of the emperor, and the many who died building the wall), but is a good early reader if your child already has a good grasp of morals and understanding around life and death. I was especially appreciative of the end of the book which offered additional facts in a “Did you know?” section. The drawings were colorful, and well done. My own daughter liked the book, but mostly because she’s already fascinated with the terracotta warriors after seeing the exhibit last year at the Asian Art Museum in San Francisco and the book covers that history as well. The Great Wall isn’t something she has a particular interest in, but now that she’s read the book, I’m going to go back and show her the pictures I have of myself on the Great Wall, from when I visited back in 1995 and in 2002. The only other thing I would have like to see in the book and didn’t would have been incorporation of some Chinese characters into the story. I’m always looking for kids books that help teach some of the simpler Chinese characters to reinforce my daughter’s Chinese school experience. Overall worth a download if you’re looking for something to share with your child for Chinese New Year. A new AARP study tells us what all of us Asian Americans and Pacific Islanders (AAPIs) already know. AAPIs are more likely than any other racial group to care for their elders. “Caregiving Among Asian Americans and Pacific Islanders” is the title of the first of three reports by AARP about issues affecting AAPIs age 50 and older. The study found that 73 percent of AAPIs age 45-55 are expecting to care for their aging parents and/or older relatives. This compares with just under half of the total population of the same age (49 percent). Along with caring for elders, AAPIs are more likely to talk to doctors on behalf of their elders, contribute financially, and handle paperwork and bills for their elders. And of course, many more AAPIs, age 50 and above, live in multi-generational households compared with the total population of Americans (17 percent versus 7 percent). Like most Asian Americans I was raised with the expectation that I’d be caring for my parents as they got older. I’ve written about some of my experience with caring for my aging parents in a previous 8Asians article that focused on which child got to take care of their parents as they got older. The AARP report though focuses on a few other aspects of caring for an immigrant parent that many children of immigrants take for granted, and for those who’ve never had the experience, probably never even realized was part of the immigrant experience. Since my mother never spent the time to perfect her English, my siblings and I were always the one to translate at the doctor’s office, and just about everywhere else starting from the time we were small kids. We also filled out all the paperwork for our parents even though we were just small children. Translating and taking care of paperwork and bills was just something that continued on into adulthood and into elder care. By the time my parents moved into my home as senior citizens, so that I could care for them more easily, I was again taking them to doctor’s appointments, and also translating, and filling out paperwork. And this time around, I was also the main financial support for the whole family. I tell this story to my own elementary school age daughter, but she doesn’t get it. Every night my daughter expects us to answer questions for her about her homework and help her figure out problems she doesn’t understand. I tell her I never had help with my homework. I mean really I had no one who would have understood the English in my homework to help. I say this and my daughter looks at me blankly, and my husband, just tells me, he’s heard it already, and enough, we’re helping our daughter with her homework. At the same time, we don’t set any expectations that our daughter will care for us when we’re older. I guess we’re too American for that. Instead my husband has purchased long-term care insurance, and tells us to put him in a nursing home when it’s time. But secretly, inside my mind, I wish my daughter will remember and will be the one to care for me when I get older. As a child, I attended public school. I didn’t have a choice, it was all my parents could afford, there was zero chance with my parent’s financial status that I’d ever get to go to private school. Even attending public school, I thrived as a student. We lived in a good school district in the state of New York, and public schools were well-funded in the 1970s. My public school was almost completely homogeneous. As someone else described it to me, my elementary school was “all-white, made up of Italians, Irish and Jewish kids”. My sisters and I were the only non-white kids in our elementary school. Generally there was no racial tension other than the occasional degrading remark about our lunches or our last name. Fast forward almost forty years and then it was my turn to enroll my own daughter for elementary school, I was a big proponent of sending her to public school and I didn’t even give a second thought to the racial make-up of the school she would be attending. We visited our local public elementary, and we enrolled her. First grade was promising, we loved her teachers and she seemed to thrive, even with the few problems we did encounter. Second grade was equally satisfying, but we could start to see the issues that did exist continue to fester. Additional programs seemed to disappear each year with funding to public schools being cut year after year. Field trips for students seemed to get fewer and fewer each year. By the time third grade came around, there were no field trips that year. And it was third grade, where we encountered “the straw that broke the camel’s back“. By the time third grade was half over, we realized there was something seriously wrong.